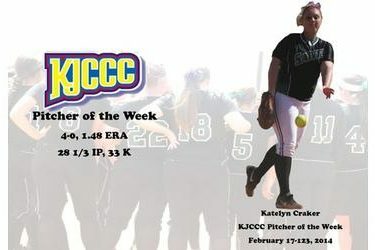 For the second straight week, Seward County sophomore pitcher Katelyn Craker has been named the KJCCC Pitcher of the Week as announced by the league on Wednesday. Craker was 4-0 for Seward last week, throwing 28 1/3 innings and striking out 33 opposing batters. She posted a 1.48 ERA and allowed less than a hit per inning. Tuesday against Pratt she went the distance in an 11-2 Seward win, striking out 7 in the process. Wednesday against Frank Phillips she again went all 7 innings for the Lady Saints, allowing just 4 hits and 1 unearned run in a 4-1 Seward win. Friday against Ranger she tossed a gem, throwing a complete game, 2 hit shutout while striking out a career high 14. Later in the day, she came in in relief and picked up the win against Seminole State. She is now 6-0 overall on the season with a 2.14 ERA. Craker has struck out a team high 50 opposing batters in 39 1/3 innings of work. Craker and the Lady Saints are back in action this afternoon at Lady Saints Field in Liberal as they take on undefeated Northern Oklahoma-Enid at 2:00 in a double header.